Find out just how easy it is to remove those pesky labels from jars! 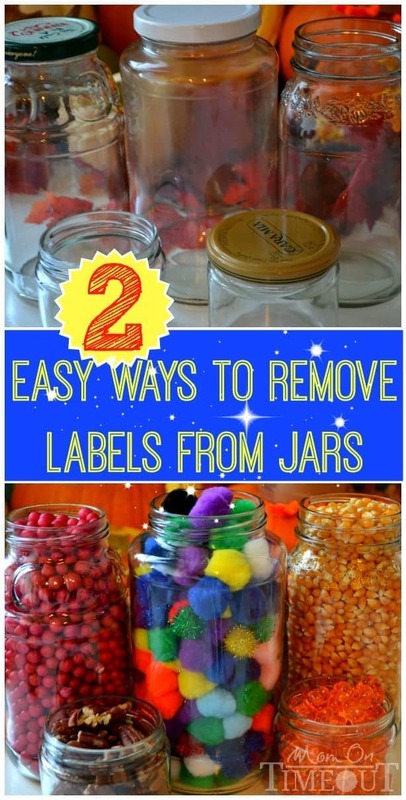 Here are two easy ways to remove jar labels! The holidays are just around the corner and to me that means more crafts. Glass jars are a great way to recycle for not only craft projects but are wonderfully useful for storage, rustic vases, and even for cleaning solutions. Cleaning the labels and the sticky residue off of jars can be an intimidating and time-consuming process. I’m sure we’ve all tried peanut butter, vinegar, hot water, soap, dishwasher, oils, etc. The list goes on and on when you ask people how they remove their labels. I’ve tried a variety of methods and have narrowed it down to the two that I find most effective and efficient. You pick which one works for you! Gather up several jars at a time to be more efficient. I like to do lots of different sizes and shapes – some of the jars even have really beautiful designs on them. For each method, remove as much of the label as possible first. An easy way to get the adhesive to release is to fill the jar with really hot water. Be careful when handling the jar and don’t burn yourself! Let the jar sit for a few minutes so the adhesive can turn more to a liquid and then start gently peeling off the label. Olive Oil is my favorite method because it’s eco-friendly and is super easy. Pour a couple drops of oil onto a paper towel and rub at the remaining residue from the label. Keep rubbing until all residue is gone. This should only take a minute or two. Make sure to wash your jar afterward to get the oil off. I just run mine through the dishwasher. This method is actually a little faster than the olive oil but you have to deal with the fumes from the nail polish remover. (You can see here that I combat this issue with “cucumber melon” scented remover 🙂 ) Pour the polish remover onto a paper towel or use the applicator if yours came with one. Scrub away at that label and adhesive and it will just slide right off. Quick and easy! Again, make sure to wash the jar afterwards. These two methods are fail-proof. I have never had a jar label that I couldn’t remove using one of these two methods. Next time you are about to throw out a glass jar think of how easy it is to re-use it and try one of these methods. Let me know what you think. Trish, following your advice, I poured hot water into the jar and peeled off the label with ease, then polished up the jar with olive oil on a kitchen towel. Next time I’ll try it with a cheaper oil! I couldn’t get the labels off to even proceed with the olive oil method, so I soaked them in hot water, Dawn and baking soda for an hour and scraped with a butter knife. Glided off easily and no residue! I know eucalyptus oil will melt away the glue off glass jars and also gets tar off your car. My daughter in-law to be is getting married in March next year and we are saving glass jars for the flowers and candels so there is a lot to be cleaned thanks so much Trish for the great advise! !